Spring is fast approaching. Wouldn’t it be glorious to settle for a hearty family brunch in the shade of the beautiful copper pod tree standing in one corner of your garden? But then, why wait for the spring to announce itself? You may even consider arranging small outdoor parties early in the evening this Chinese New Year itself. To do so however, you need to prepare the area properly. Create a welcoming nook for your guests and make sure none of your plants and flowers is hurt in the process. This should not prove to be too cumbersome a task, if you only care to prepare in advance. When applied properly, these suggestions will help you enjoy some of the most fun filled garden parties you can ever imagine. And, we are not only preparing for parties either. You can also build yourself a cosy little place to enjoy a bit of solitude, bask in the sunshine or read a good book. So let’s get started. 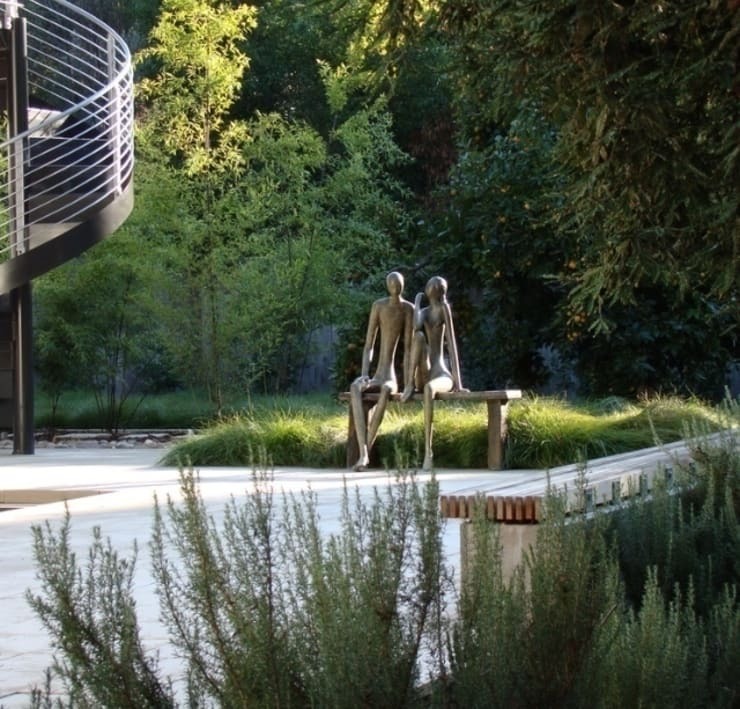 Today, we are going to share with you a few tips of creating the most remarkable outdoor space in your own garden. Select a spot appropriate for your purpose. If you are building romantic hideout, you may prefer selecting a spot slightly secluded and studded with beautiful trees and flowers. On the other hand, an outdoor entertainment zone is best kept closer to the house. If you have a particularly favourite corner in your garden then you may like to reserve it for yourself only. A naturally shaded area is especially suited for places that experience long hot summers. For building a swimming pool complex though, you will have to select an area that does not have big deciduous trees nearby. To create a simple chatting zone, place a bench or two. Alternatively, consider decking this up with a couple of cosily upholstered chairs. Complement it with a coffee table. You can create a more elaborate chatting zone by placing large heavily upholstered sofa with suitable tables. Choose appropriate materials capable of withstanding the elements of nature. Teak is a perennial favourite. Treated wrought iron with aluminium coating is another preferred material for outdoor furniture. All weather wicker furniture made of synthetic resin is considered very fashionable nowadays. Choose cushions that have water proof covers like those made of acrylic coated polyester, polyester cotton blends, vinyl coated cotton, canvas, duck cloth etc. Build a DIY fire pit or bring home one of the readily available ones. Chillier nights will be comfortable in their presence. They will also help to light up the surroundings. Here are some of the options for you to choose from. - Permanent outdoor fire pit made of brick or stone. For something more elaborate, you may replace this with an outdoor fire place as well. 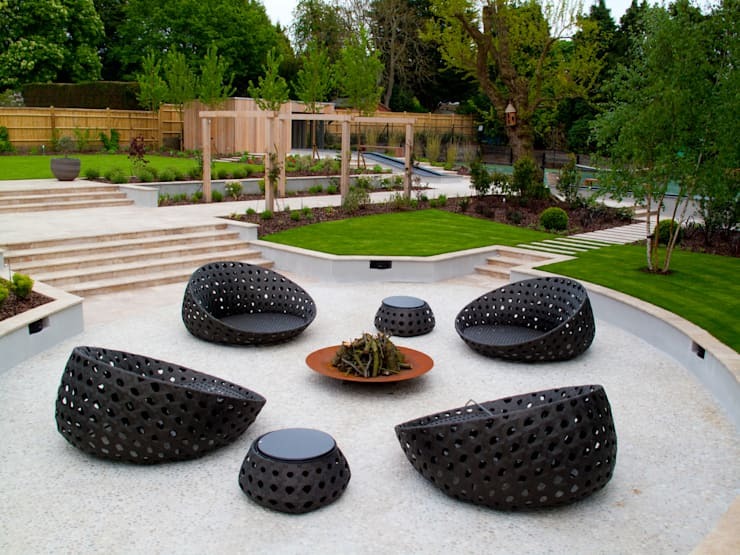 - Portable fire pits made of cast iron, copper or ceramic. These can easily be wheeled away from one place to another. - Chiminea fire pit which looks more like a chimney. These are generally made of metal or terracotta and bring a charming old world feeling to any garden. - Sojoe fire pit that looks more like a big fondue pot, is decorated with a variety of motifs and can double up as a rotisserie. - For small places and, also, for the sake of convenience a fire pit table can also be introduced in this arena. Of course, this is not to douse the water, but to create a tranquil corner in the garden to sit and watch the time glide by! You may follow one of our guides to create one right in your own backyard, or seek professional help to introduce a stream or a fishpond in your garden. 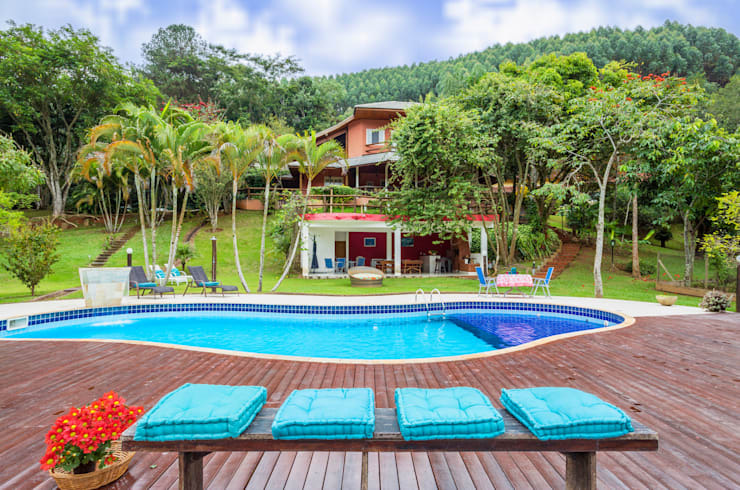 Alternatively, you may consider having a separate swimming pool complex complete with a beautiful sundeck. Have some lounge chairs strategically placed by its edges. You can steal away an hour or two everyday swimming in the pool and then sunbathing with a glass of your favourite drink. Arrange an outdoor dining area close to the swimming pool complex or any other spot of your preference. Choose appropriate furniture to deck up the area. You may prefer having wrought iron, aluminium or teak furniture that are strong enough to withstand the onslaughts of rain and sunshine. Dining table with mosaic tops or sandstone tops will be a fine choice for any garden. Synthetic wicker or pvc also proves to be an apt choice. Do not forget to create a barbecue zone. 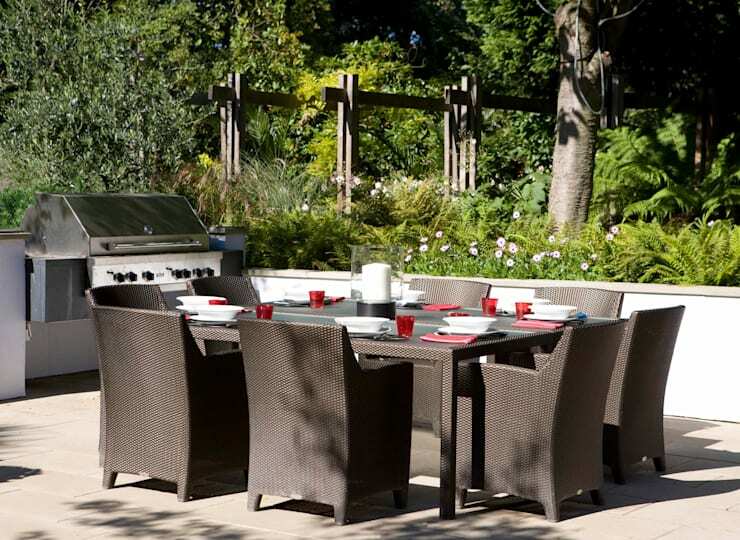 You may construct a permanent BBQ yourself or select one of the ready to install BBQs. - Though more expensive than the traditional ones, gas grills are becoming popular by the day. Sheer convenience of using and maintaining them are the main reasons behind this. You will miss the charred woody flavour in your food though. - Charcoal grills are even more expensive than the gas grills. But they help serving more authentically flavoured barbecued meat, fish and vegetable dishes. - Electric grills are good choice for small gardens or patios. But they would not be enough to cook up the traditional smoky flavoured barbecued recipes. Make sure you are not violating any of the fire regulations by installing them on your sundeck or terrace. - Portable grills are best for occasional family picnics or outdoor dining. Due to their smallness of size preparing food for large parties become difficult with them. Help your children to have a fun time too. 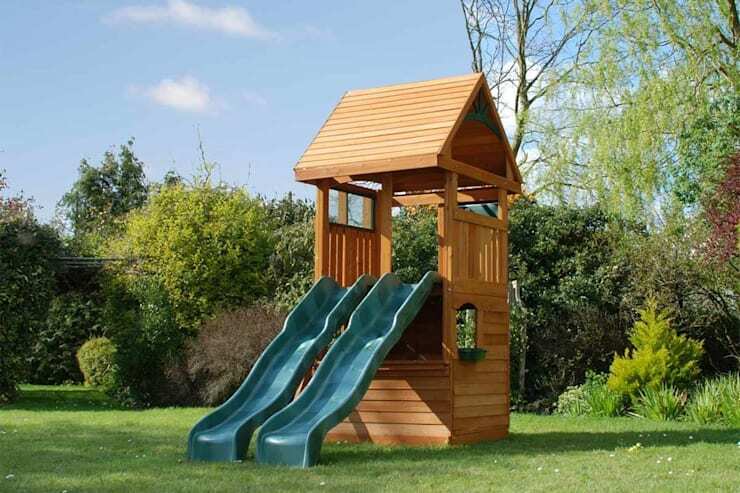 This children’s hut by Selwood Products combines a climbing frame and slides. You can opt for something of this nature or consider building your little ones a fairy cottage. Swings, trampoline and outdoor furniture suited for children can be placed nearby to keep the kids’ happily engaged all day long. They can have some precious playful exercise in the closeness of nature this way. 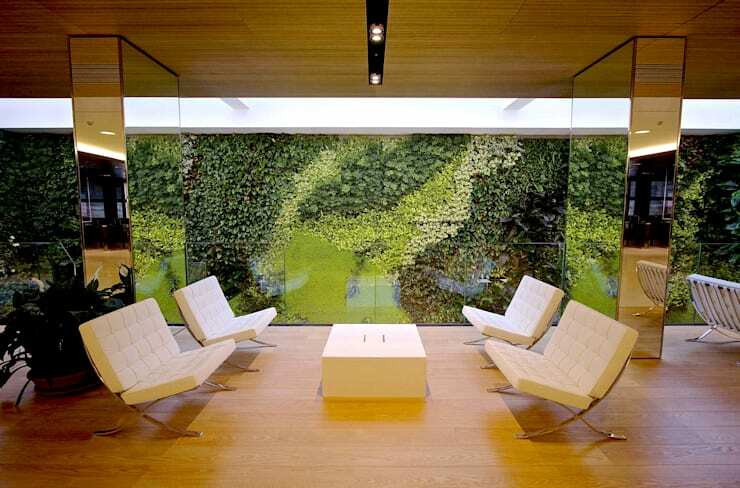 Mainly due to an extreme space crunch vertical gardens are becoming very popular. Though you cannot reasonably expect to have all the enjoyments of being outdoors, it is still a commendable way of bringing home some of our much needed green friends. Decorate the area with the same meticulous care as you would have for an outdoor entertainment zone. Pick up some basic nuances of gardening. When possible, involve children and other members of the family in the project. This could be one of your most worthy preoccupations and in time you can be most proud of your achievements.